Good gracious the trip from Bali to Halifax is a long one – about 35 hours from the time I left Denpasar until I arrived in Halifax. I’m exhausted – didn’t sleep much on any of the flights (although I had three seats to myself from Bangkok to London and tried stretching out, it was sufficiently uncomfortable that I dozed but didn’t really sleep more than an hour to two); watched five movies, and several episodes of House of Cards, The Mentalist, and Ray Donovan (one movie I watched twice: “Words & Pictures” with Clive Owen and Juliette Binoche). I am glad to be home. My neighbour just gave me two eggs and some bread so I can make myself a “Thanksgiving” Dinner (today is Canadian Thanksgiving). Then a long hot bath and to bed. Life returns to normal tomorrow – I will have to find places to store the fabrics I bought – that will involve getting rid of some stuff to make room for them. My first sewing project will be to pick up where I left off on the art piece of the two boys walking beside the Public Gardens. Then who knows what I’ll decide to work on next. 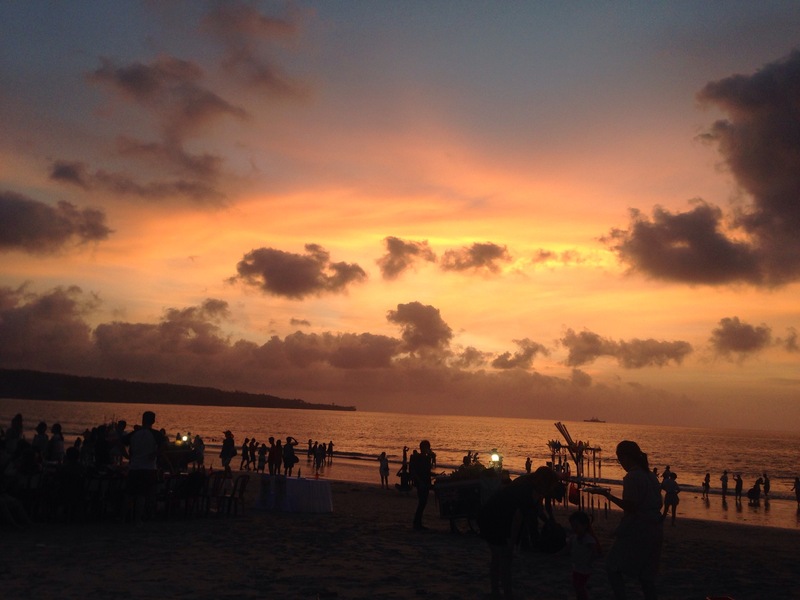 and watched (sort of) the sun set while we ate a tasty meal of grilled prawns and red snapper. After we got back to the resort, we spent a half hour doing a “show & tell” – sharing a few of our new found treasures. Then off to bed we all went. 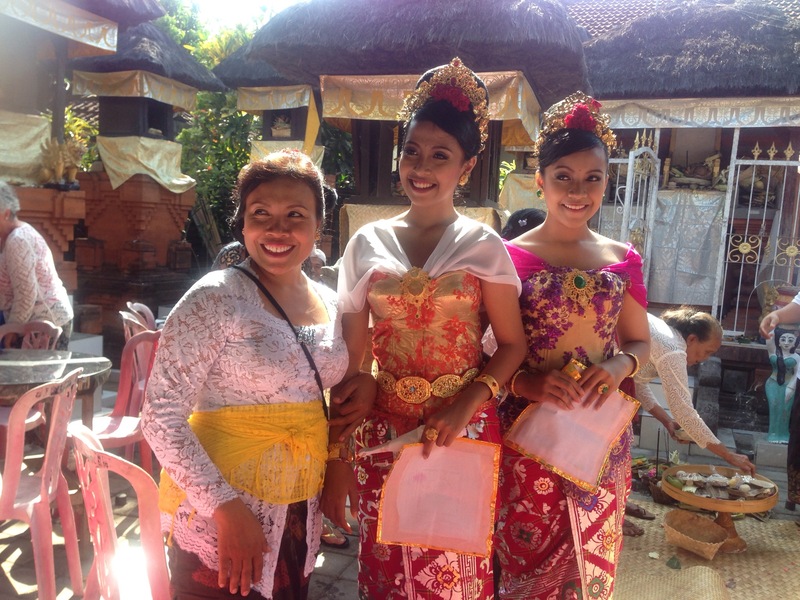 We met at breakfast to say goodbye to those people moving on – one flying home, three heading back to Ubud for a few more days of shopping and island living. I spent the morning with two of the gals remaining for a couple of days. 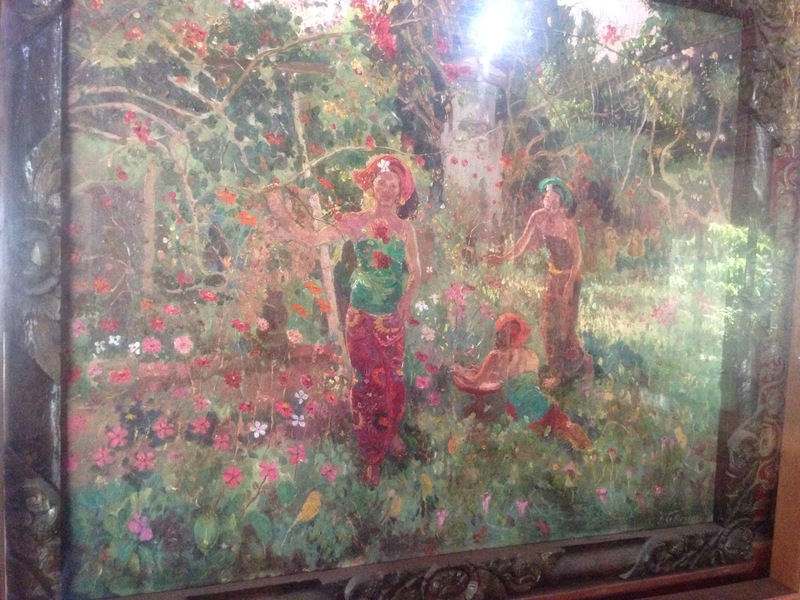 We decided to visit a small “museum” dedicated to the “art” of a Belgian painter, Louis Mayeur, who moved to Bali in the 1900s, became fascinated by a much younger Balinese dancer, married her, and spent the rest of his life painting her. 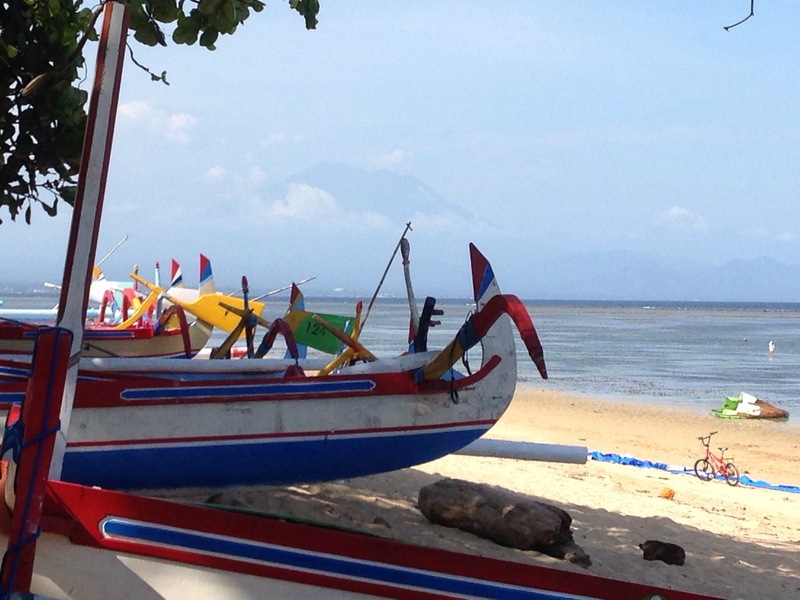 The museum was located on Sanur Beach, a shortish cab ride up the east coast from the resort. 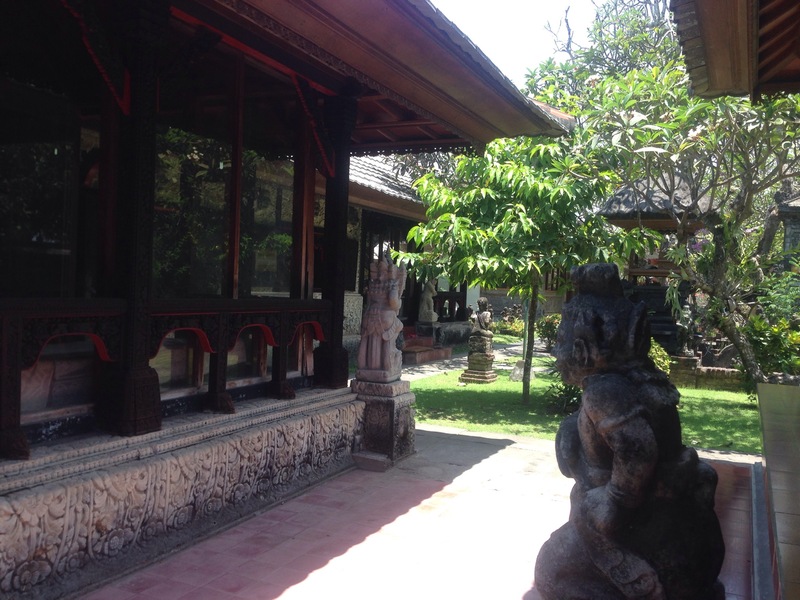 The buildings/compound were bequeathed to the Balinese government on his death (sometime in the 1940s – if I recall at all correctly). Hence the museum. But there was little in the way of an art collection – what was there were mainly aging paper reproductions which have faded so badly you could get no sense of the vibrant colour of the originals. Oh well, all part of the Bali adventure! So we soon grabbed a cab to take us back our part of Sanur where we had a light lunch, followed by some yummy gelato, then a short walk back to the Puri Santrian and a cooling off dunk in the pool. Those of us remaining are gathering at a nearby Italian restaurant for a light dinner. Afterward it will be time for me to finish packing. I began packing this morning and have been able to fit fabric purchases all into the bag I plan to check (have to weigh it to be sure it makes the limit). Everything else will get stowed in my carry-on bag – one of the benefits of not traveling with much in the first place! I leave Bali at 4:20pm tomorrow (Sunday), arriving home Monday. 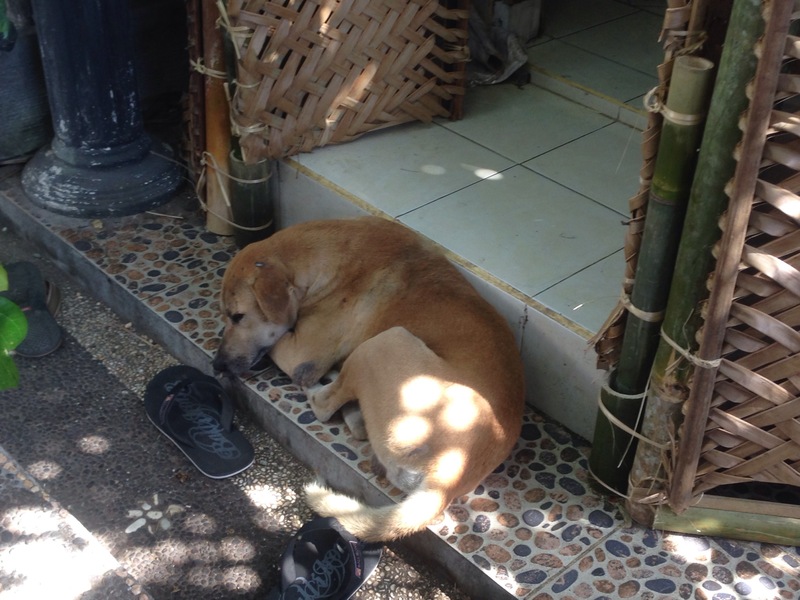 Bali has been interesting; however I have no desire to live in this place – too hot, too humid, too busy, traffic unbelievable (I’d never summon the courage to drive). As much as I’ve enjoyed the two week interlude, I’m ready to get back to my usual life. 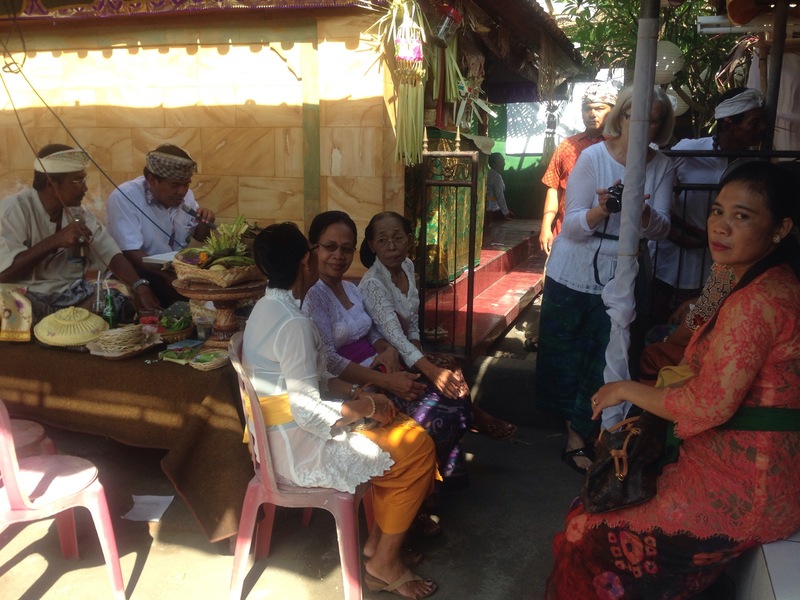 Definitely a struggle to get out of bed at 5:45am but to experience first-hand one of the principle Balinese ceremonies was worth it. The thing that stood out for me, having been family at Benjamin’s Bar Mitzvah at the end of August, was how similar in concept the two ceremonies actually are. Both represent official passage to adulthood. Both involve the participation of family and friends. 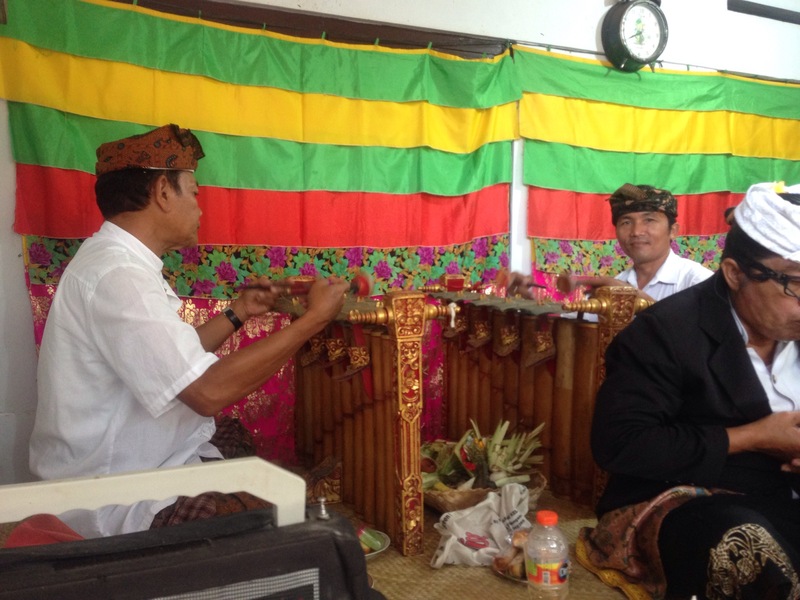 Both have set rituals revolving the chanting from scriptural material. Both are celebrated with feasting… The parallels are striking! 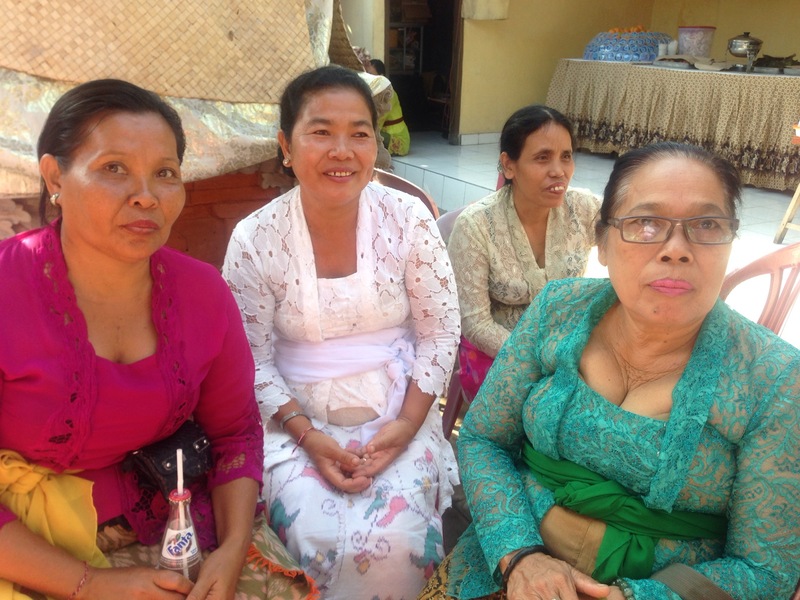 A small group of women nearby smiled, and beckoned me over – they didn’t speak any English, I have no Balinese, but it was clear the woman on the right, in green, approved of my attire. She pointed to my white shirt and gave me a thumbs up, felt the sash and repeated the gesture, pointed to my earrings and gave her approval once more. All four were curious about where I lived – Canada, they understood although I’m sure they have no idea where that is. The compound was packed – women mixing with women, men with men. I tried to ascertain the relationship of what was clearly the oldest of the women present, but my English query “Grandmother?” brought gales of laughter. I have no idea who she was. 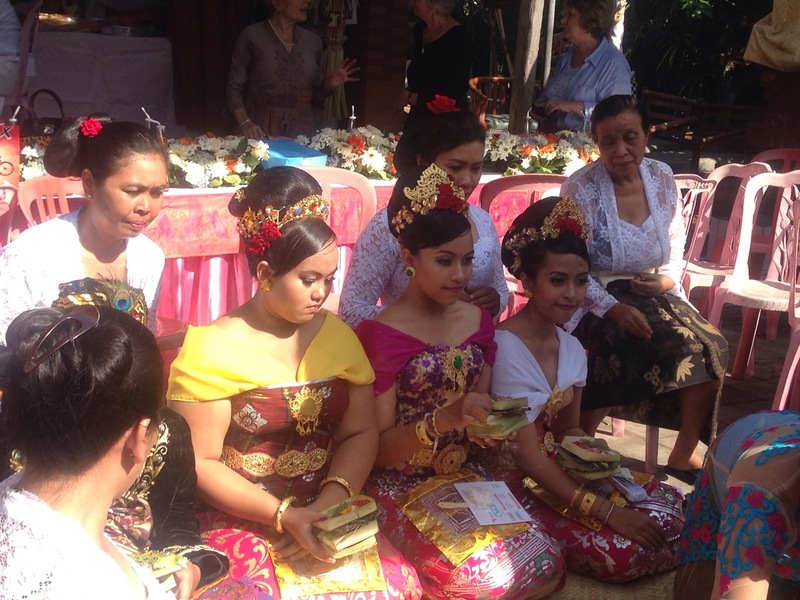 Even the dog was part of the celebration – whether a family member or the local stray I was unable to find out. We left before the feasting actually began but it was obvious this celebration is not unlike a Haida Potlatch, an opportunity to show off hugely by sharing lavishly with friends and family. The cost of this event – it may well have run into $3,000 – an enormous expense for a family who earn relatively little. Didn’t realize how tired I was until we had a day to spend on our own. I got up somewhat later, had a leisurely breakfast, then sauntered outside the hotel grounds to find a spa for a massage. 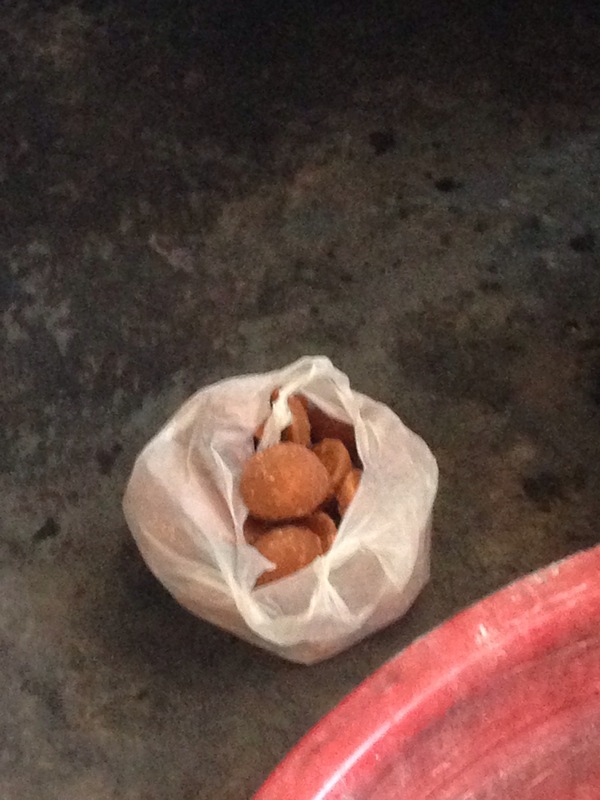 Located one quite close to the Puri Santorian (the hotel) – a pleasant young woman who had exceptionally strong hands. I felt totally relaxed by the time I left. I wandered down one side of the street and back the other – the shop owners are incredibly aggressive – they do their damnedest to get you into their shop “just walking; just looking” and carrying on. I didn’t buy anything; wasn’t looking for anything – what fabric and clothing that is for sale in these small shops is for the tourist market and not of “first” quality – it doesn’t compare with what we’ve seen elsewhere. 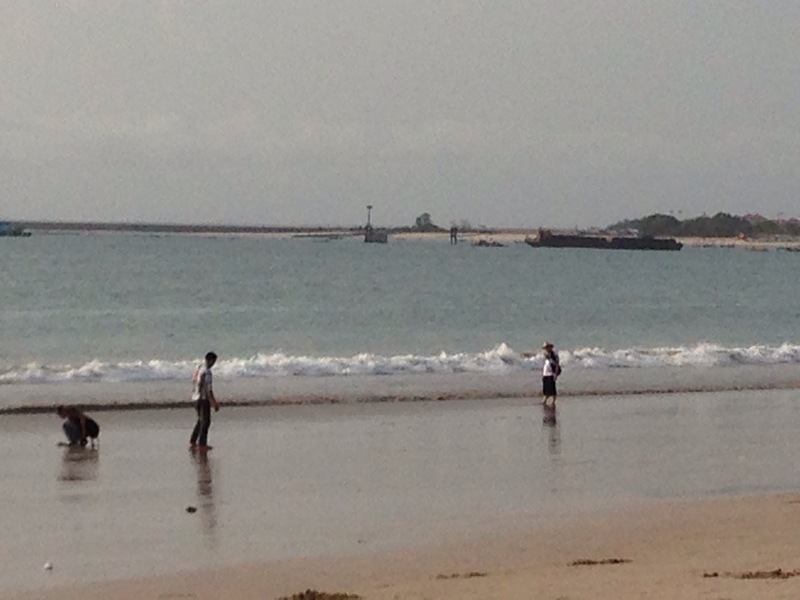 I actually didn’t get very far from the hotel because it was a hot day – I don’t know what the temperature was but away from the shore where there is no breeze, I could feel the lethargy set in. I returned to the hotel for a rest and a light lunch, read in the shade on the beach for a while; came back for a snooze. It’s now time to think about something to eat again. I probably won’t venture far, then an early night, tonight. 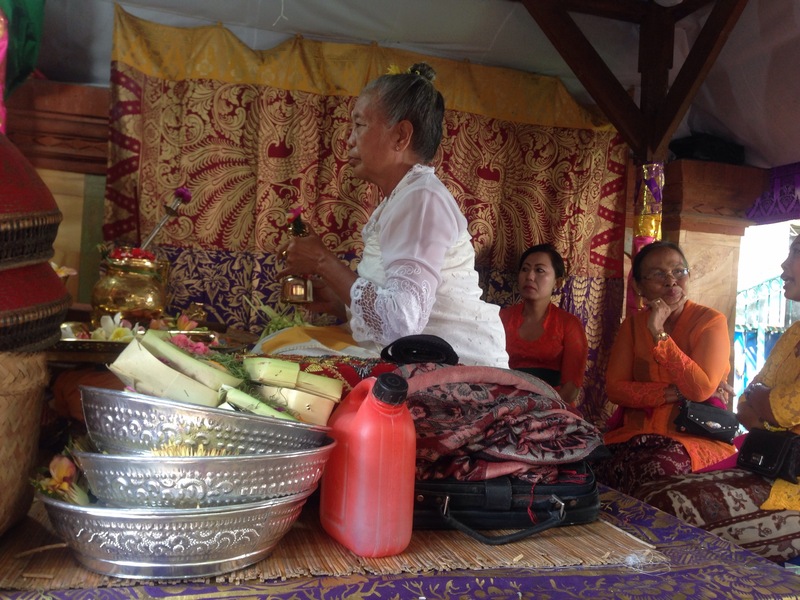 Tomorrow we will be leaving the hotel by 6:45am to head into the countryside to be guests at a “tooth-filing” ceremony – a coming of age ritual for both boys and girls. 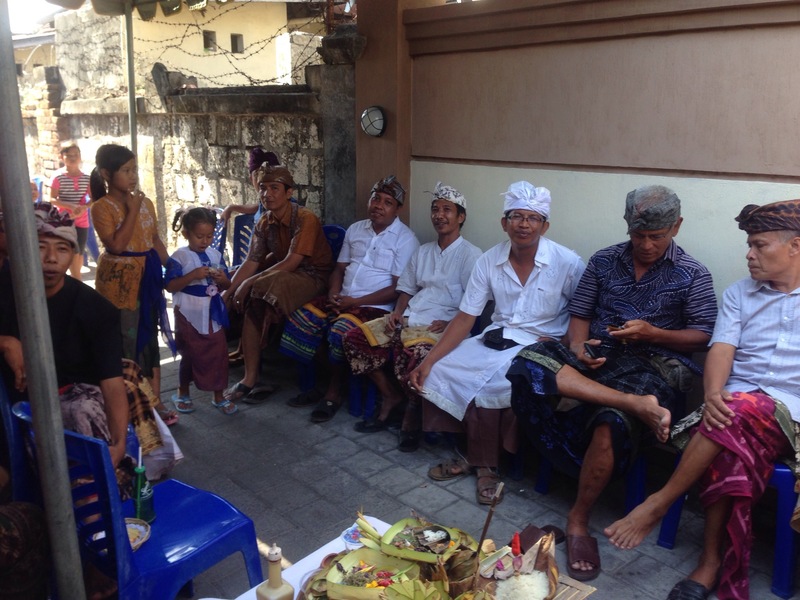 I wasn’t sure I wanted to be up and ready to go at that hour but realized non-Balinese rarely have the opportunity to witness this ritual, so I decided I would attend. More about all of this with some pictures, perhaps, tomorrow. 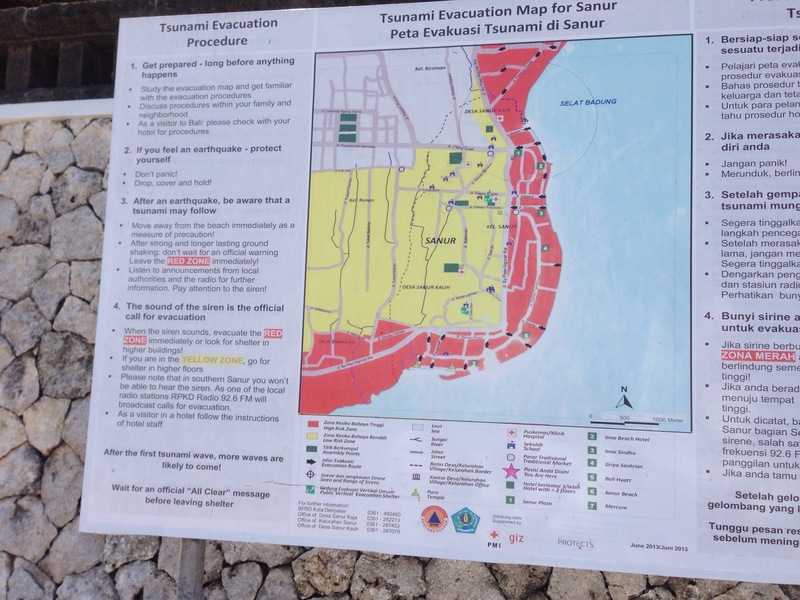 This is a sign on the beach – what to do should there be a tsunami warning! 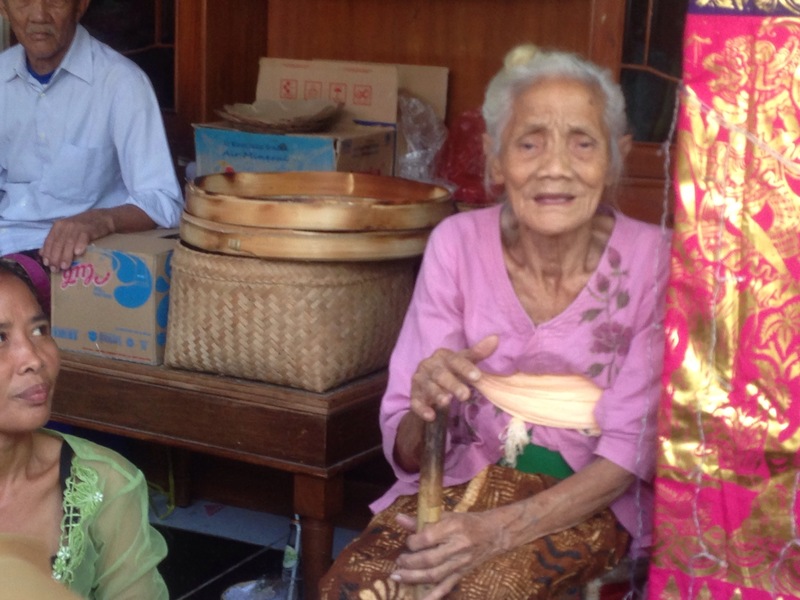 Finding artisans who dye fabrics with natural dyes is becoming harder and harder. 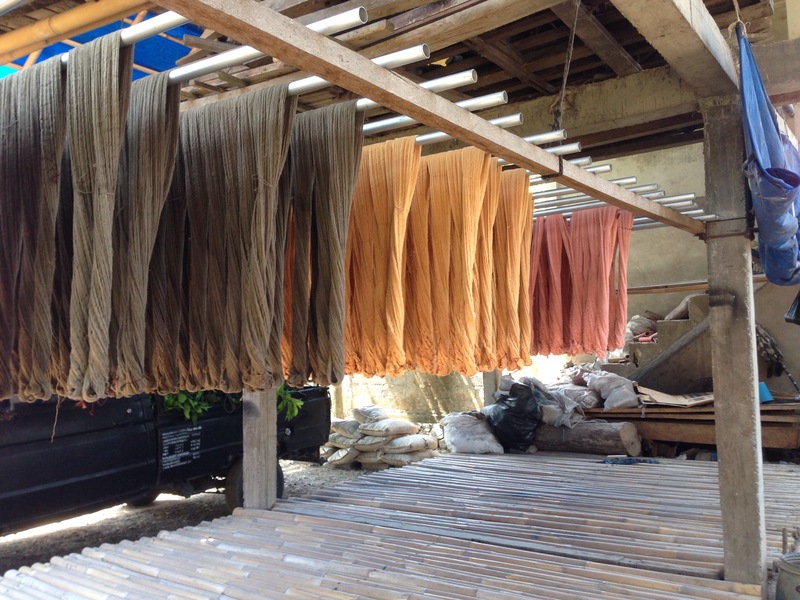 Natural dyes produce more muted colors than chemical dyes, they may fade more rapidly, and it’s time consuming to do enough for commercial production. So most dyers use chemical dyes. 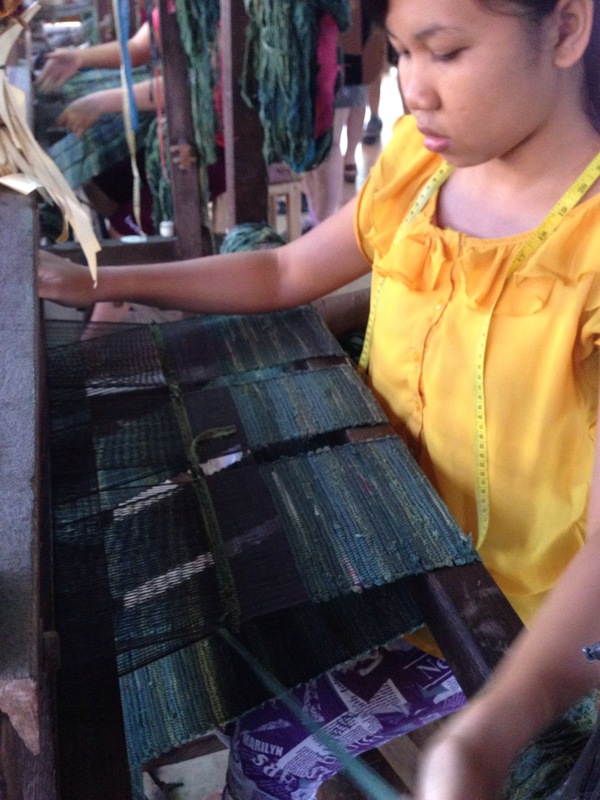 However, today, we were able to visit a small enterprise that both produces natural dyes (from mahogany leaves, from mango leaves, as well as from indigo vegetation …) and dyes the yarn to make fabric. They have an active dying operation, as well as many looms for producing both fine woven yardage as well as rag fabric strips for making floor rugs (as well as placemats). The white board hanging on one of the walls listed six jobs currently in production. 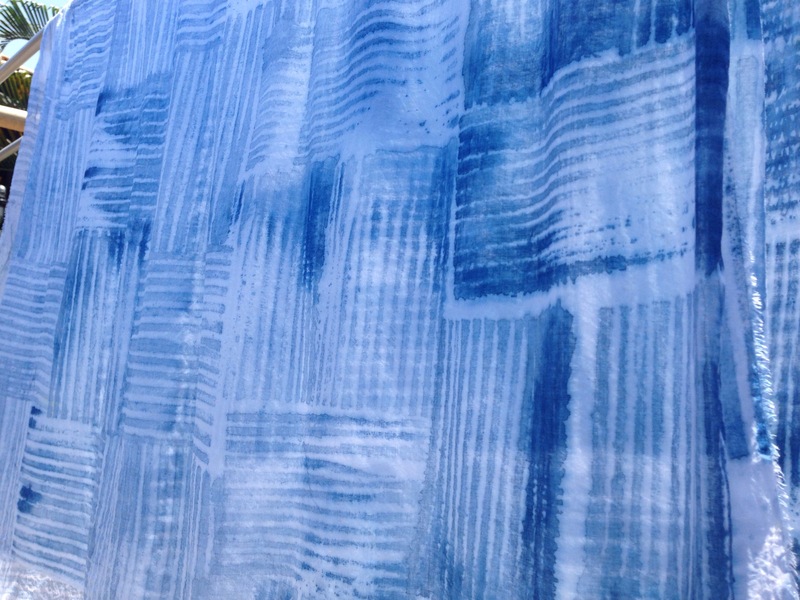 They dye both yarn and fabrics with indigo. 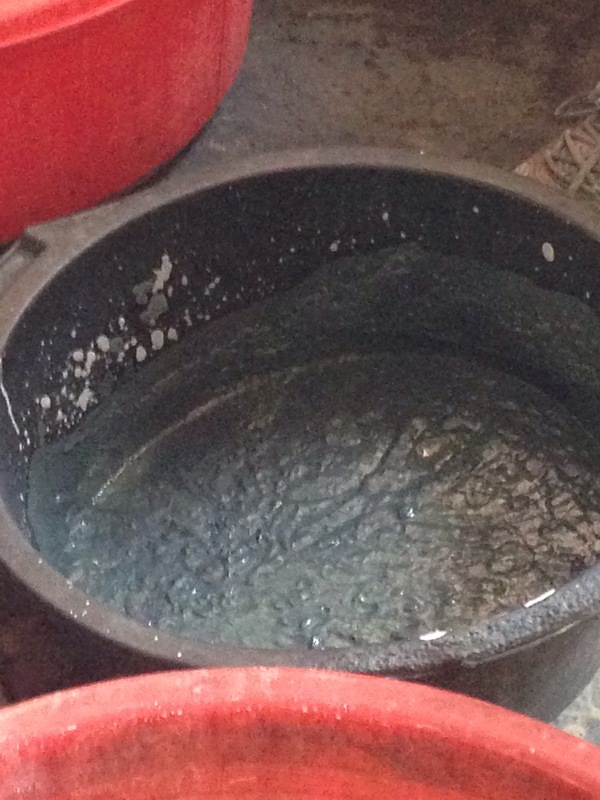 We were walked through the process of making natural indigo dye. aerate it in a mixing vessel for four hours, then add lime to the darkened mixture which thickens it to a near paste consistency. 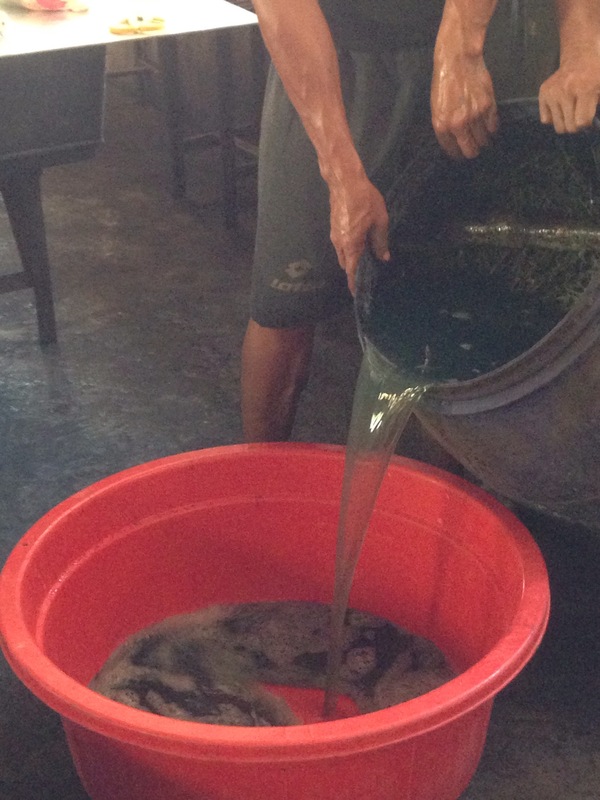 Finally add Palm sugar – this apparently creates a chemical structure that allows the dye to penetrate and adhere to the fibers being dyed. 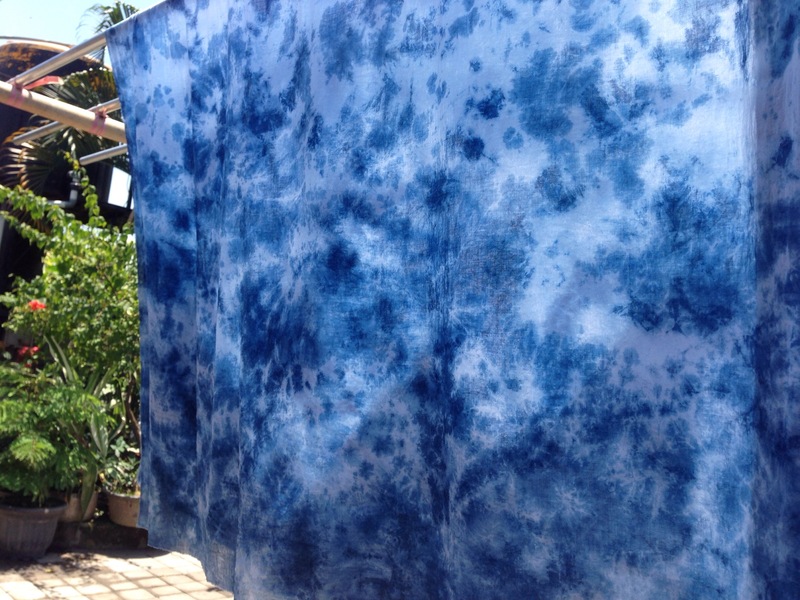 The indigo dye is applied to a wet, washed, & rinsed fabric. 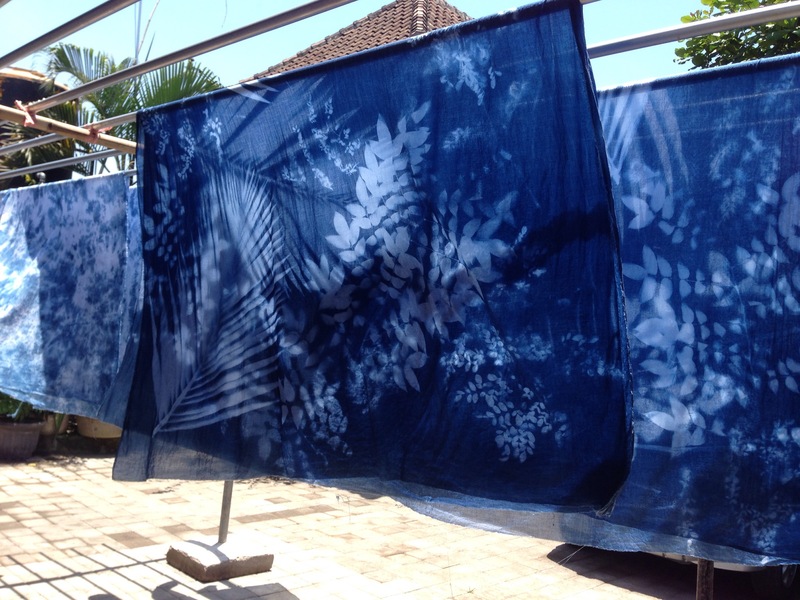 Once the indigo is applied, the cloth is washed, fixed with salt so the dye will resist fading, then the cloth is hung in the sun to dry. By the time we were organized to depart, the cloths were dry and ready for us to take them home. 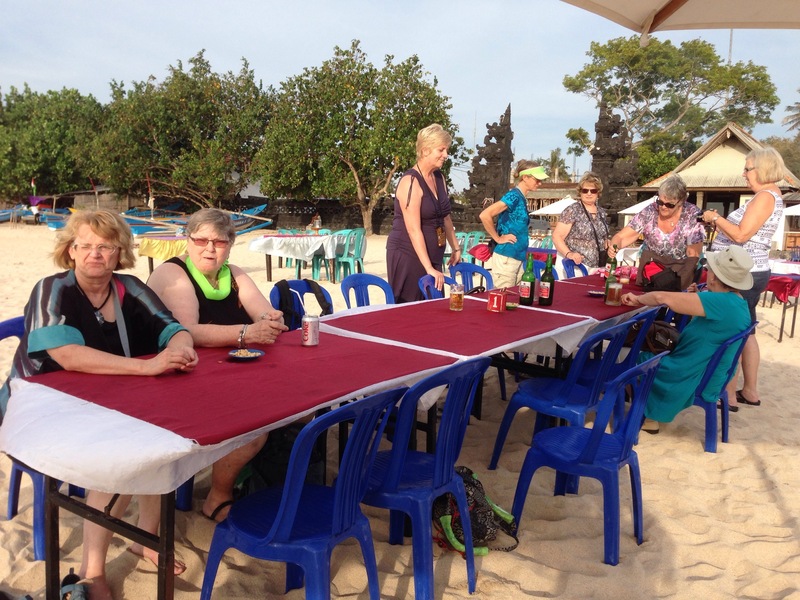 We returned to Sanur for a late lunch then a leisurely mosey back to the hotel, a swim to cool off, then out along the ocean walk till we found a place to eat that suited. 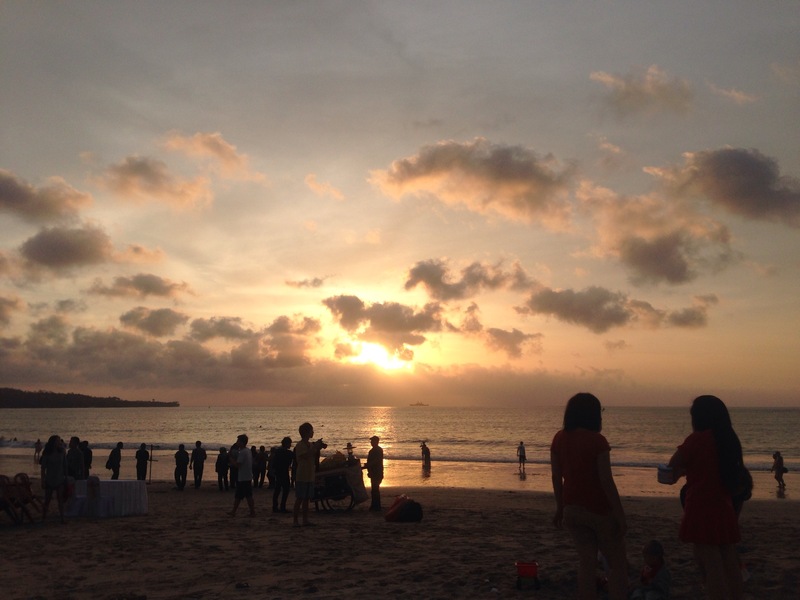 Tonight, in addition to being a full moon (celebrated by all Hindu Balinese) we witnessed the latter stages of a partial eclipse! Now how’s that for exotic? I’ve tried capturing the traffic in photos but photographs don’t come close. Nor would a bit of video! 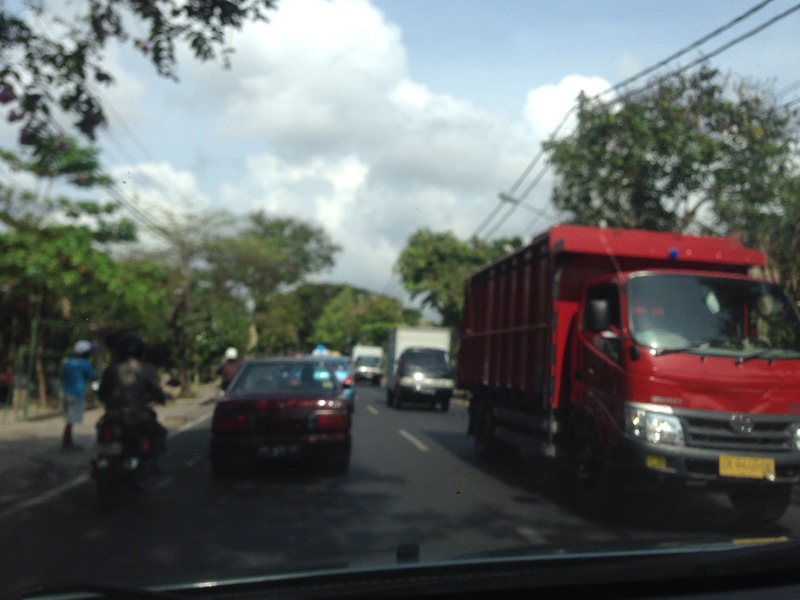 Bali traffic just has to be experienced. 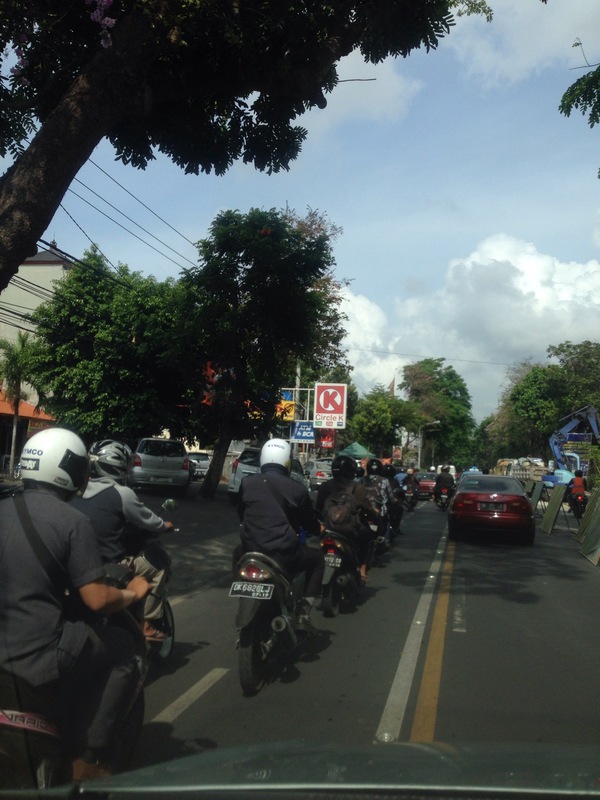 At a stoplight, the motorcycles and vehicles line up as if they are on a Formula 1 track waiting for the checkered flag to start the race…the light changes and they’re off at top speed all jockeying for position. God forbid you might want to cross the street. Yesterday, we had to cross the street near a busy intersection – had there not been security guards on both sides of the road we’d be standing there still. You have to be brave enough to actually step out with your hand extended signaling “stop” and pray the bikes and cars will actually notice and you have to keep in mind the traffic direction is the opposite of North America so be sure to look LEFT first! 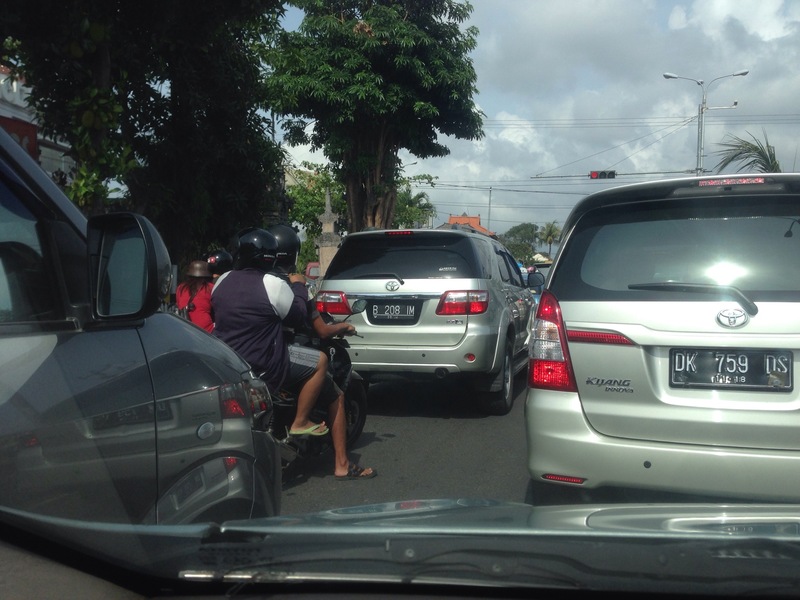 This is contemporary Bali. 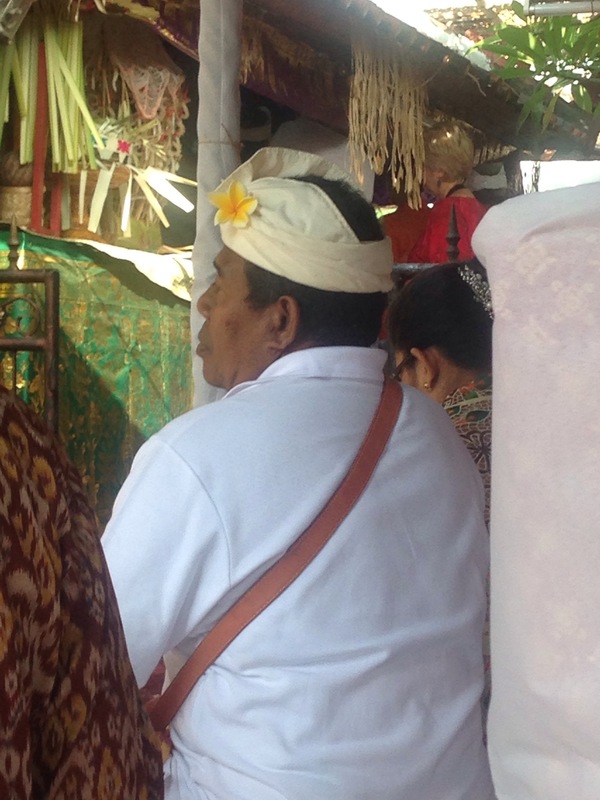 And on the narrow streets the Balinese ability to judge millimeters is simply to be admired! I couldn’t come close. 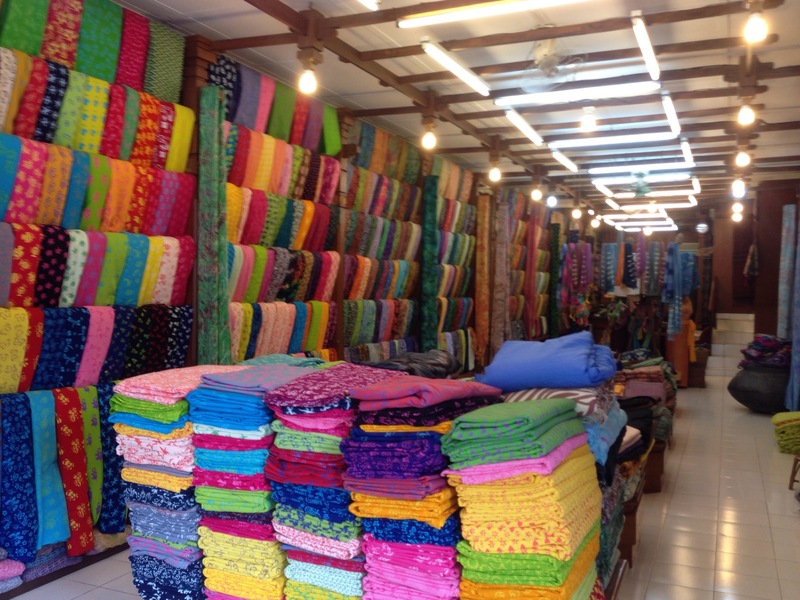 Shopping in Bali is a bit like shopping the Yellow Pages – for lots of things you go to the location where whatever it is is sold and you will find many shops selling the same commodity. That’s how it was today shopping for cotton quilting batiks! 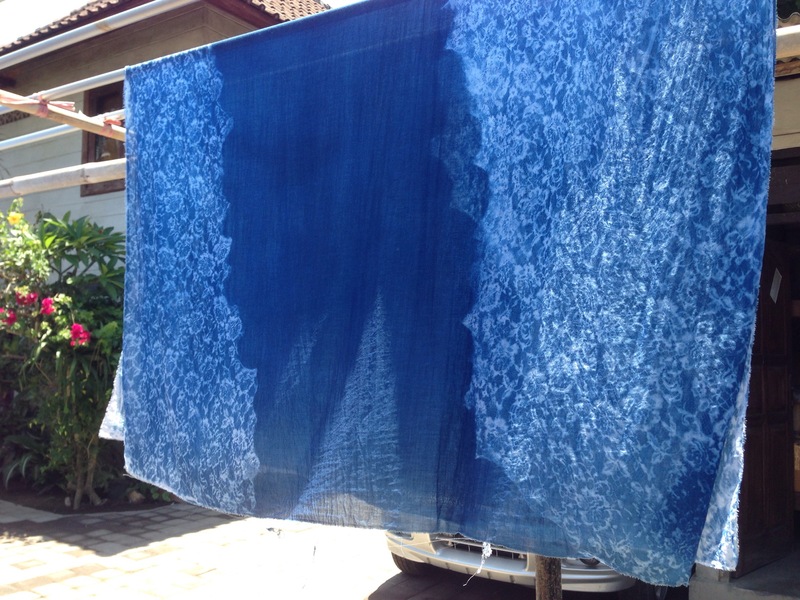 We returned to Denpasar to the quilt fabric street to look at cotton quilt batiks. 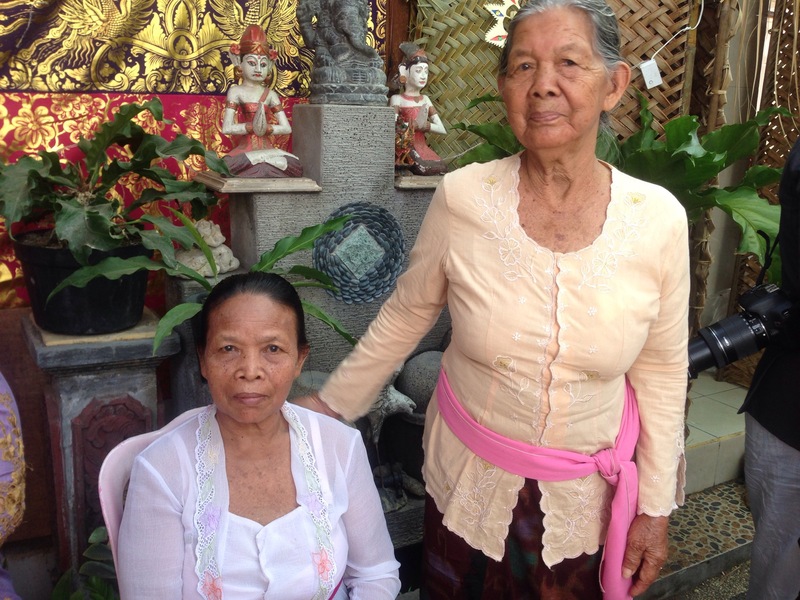 Barb and Cheryl, after years of coming to Bali, have established a relationship with a number of wholesale quilt fabric vendors. Rayyis’s shop was our first stop. 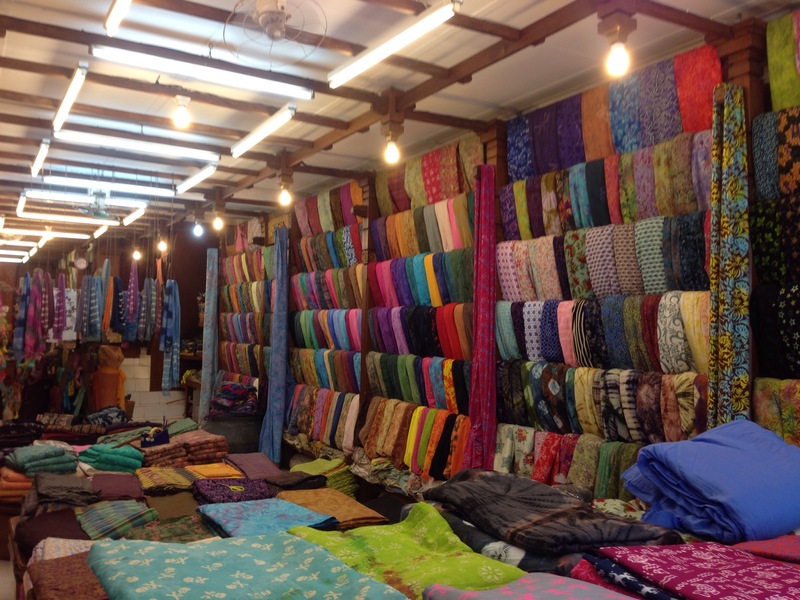 He had a terrific selection of cotton quilting batiks (there was also a lovely rayon batik selection as well, but having bought some already, I wasn’t interested in looking at those fabrics; my focus was on quilting cotton). 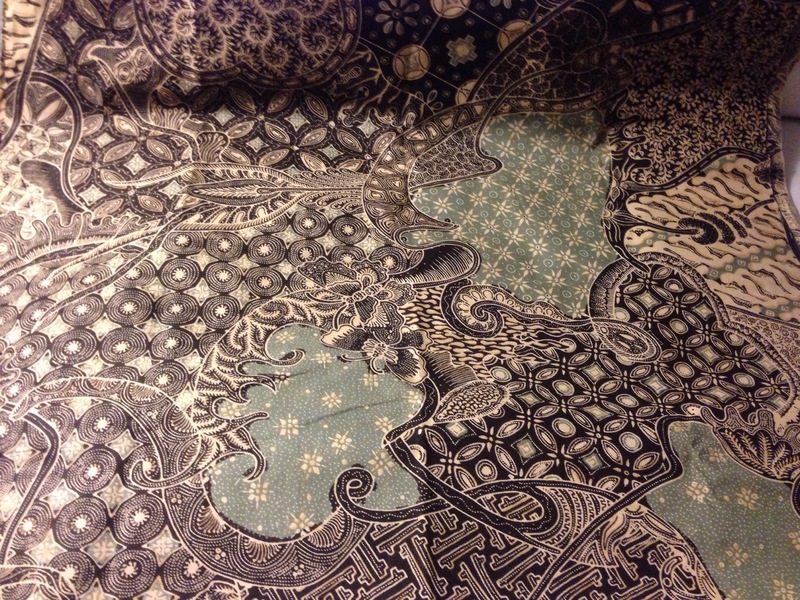 Rather than buying large cuts of a few cotton fabrics, I was looking for fat quarter and jelly roll collections which would give me a large number of smaller coordinated fabric pieces. 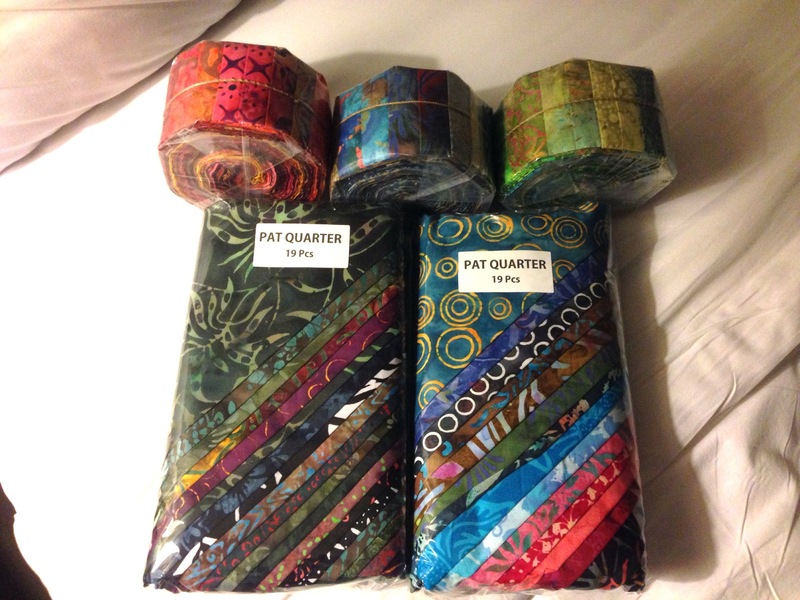 Rayyis had lots of both making it hard to reach a decision, but in the end I chose two fat quarter collections (19 different fabrics 18″ x 22″ – half of a half yard), and three jelly rolls (40 different fabrics in strips 2 1/2″ x 44″) for a third of what they would cost at home (I am not counting in my travel costs here). 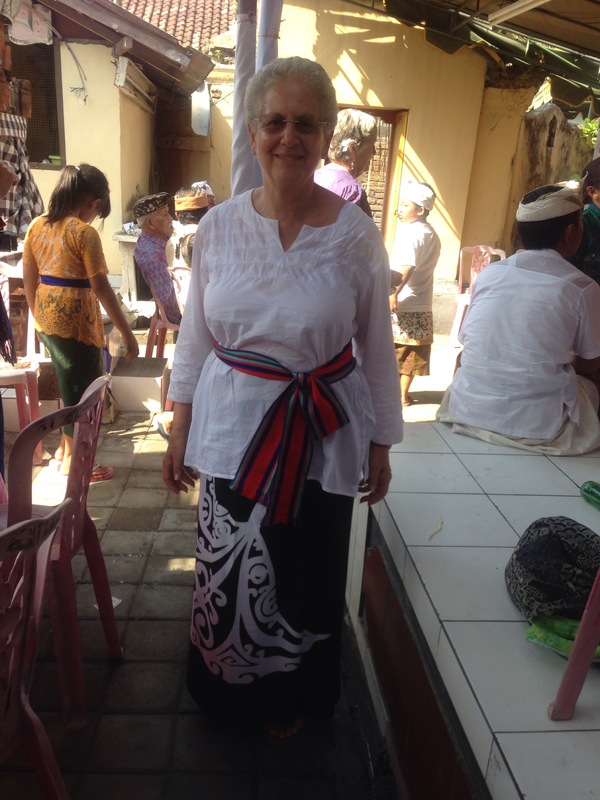 The next stop, a few shops down the street, we found some traditional Javanese prints on a wonderfully silk-like cotton fabric. I couldn’t walk away from it – I bought a meter. We could have spent days here poking into shops – each with slightly different selections, some high quality fabrics, others of lesser quality – all interesting. 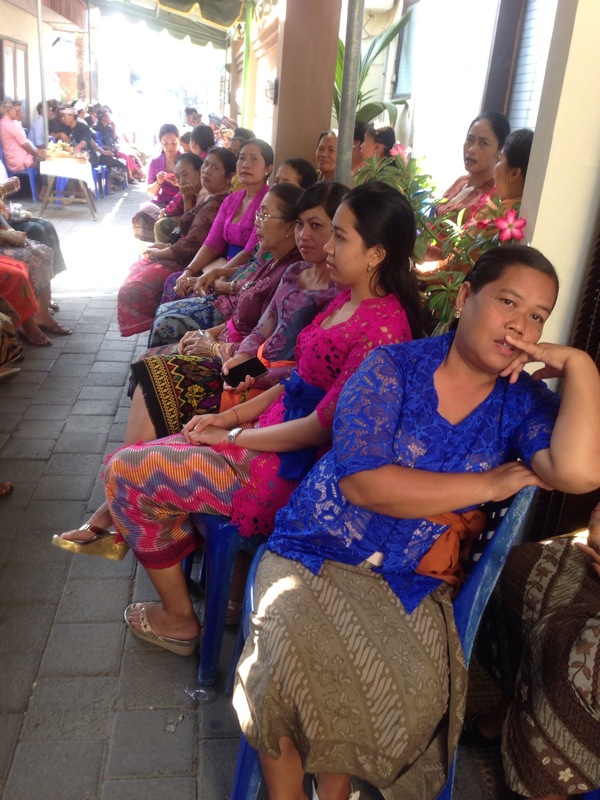 But there were other sewing related stops to make so we headed back to the Bali Bakery for lunch. 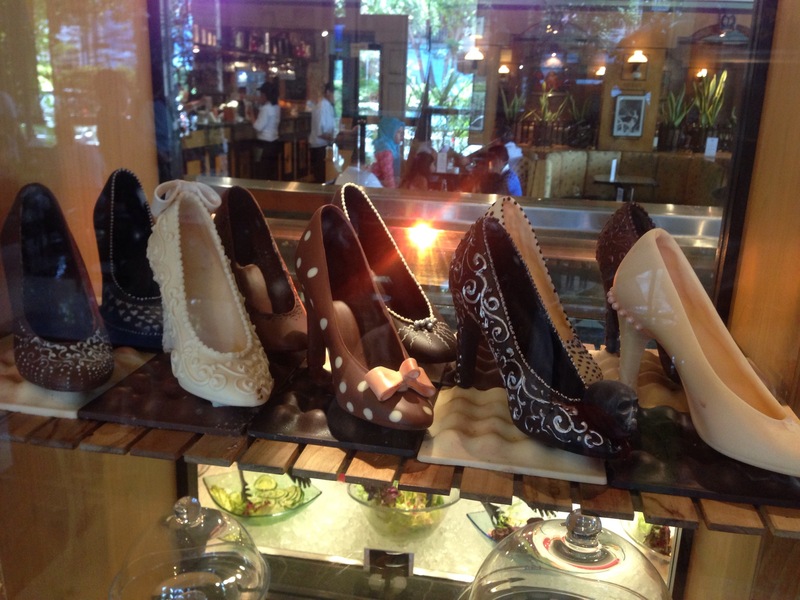 We had eaten there yesterday – as we were leaving, I noticed a shelf of shoes constructed of chocolate! Our afternoon was spent in two wholesale shops across the street from one another (both part of the same business) browsing through beads, lace, elastic, feathers, you name it. In the end I came away empty handed because either the item I looked at was only sold in large quantity, or because you need a specific notion for a particular project. These items are hard to stash. By mid afternoon we were done in. We returned to the hotel and spent an hour in the pool cooling off.